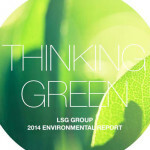 I just wanted to make sure that you don’t miss the latest edition of ‘Thinking Green’, our company’s Environmental Report. You can download it here. This year’s report offers five really interesting best practice examples from around the world that show how our Customer Service Centers “think green” in their day-to-day business and continuously find ways to reduce our environmental impact. The pdf of the report is interactive and offers several links to videos and websites that are definitely worth a look and read. For example, you can learn how organic waste can be literally transformed into water, what correct chemical storage should look like and how “smart” temperature sensors can help reduce your electricity consumption. If you want to know more about our Environmental Management System in general, the report gives you a quick overview on how we work. Last but not least, it also highlights our remarkable achievements with regards to savings by means of water, energy and waste reduction since 2008. But have a look yourself and let me know what you think!